Love the TALL strip this week! Nice ‘star’ effect and some really great expressions! As always, such a pleasure to read! I’ve read through this comic from beginning to now and I must say it’s brought quite the smile to my face. 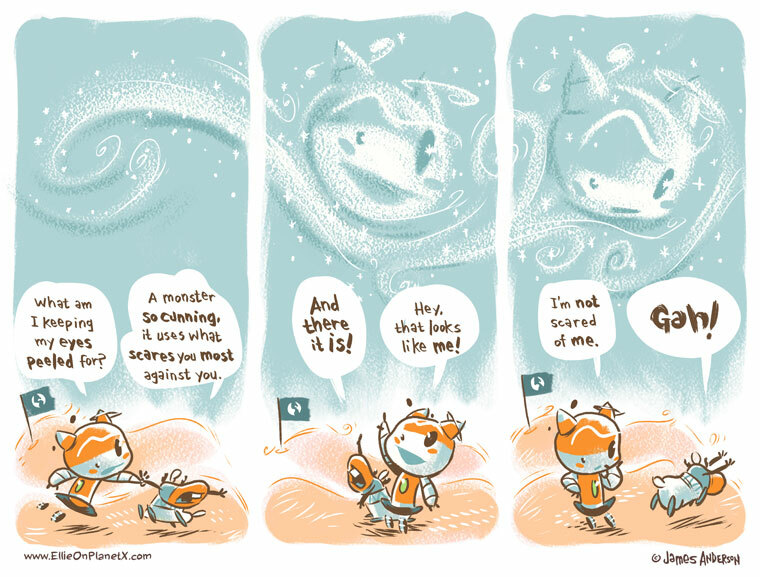 A nice blend of witty and fantasy that reminds me of Calvin and Hobs on an interstellar level. I look forward to seeing more of what this fantastic world world of yours has to offer! Thanks so much, Raven800. That’s the kind of thing that just makes my day. I’m thrilled you like my comic and welcome aboard! It’s just as eerie as it needs to be, love it! Thanks, Wouter. Look for more eerie in the future. Run, Muffin Run! It’s a giant Ellie! It’s going to name you and study you and cuddle you big time! Put like that, it DOES sound scary.